It is the expressed intent of this Comprehensive Land Use Plan to maintain the agrarian and rural character of the Town of Concord. The basis of this direction is the overwhelming response by Town citizens to the following: the 1996 Household Survey for the Town of Concord administered by Jefferson County, the 2003 and 2005 surveys done by the Town of Concord Park and Plan Commission, visioning sessions held in 2006, the responses to the Citizen Questionnaire sent out in November 2008, and the majority of citizen input during the preparation of this Plan. The direction given by the majority of respondents in all of these cases indicates both a long-standing and a continued desire to maintain the rural character of the Town. Additionally, a plan with this goal will be in keeping with the policies of Jefferson County toward preservation of agricultural lands and open space. 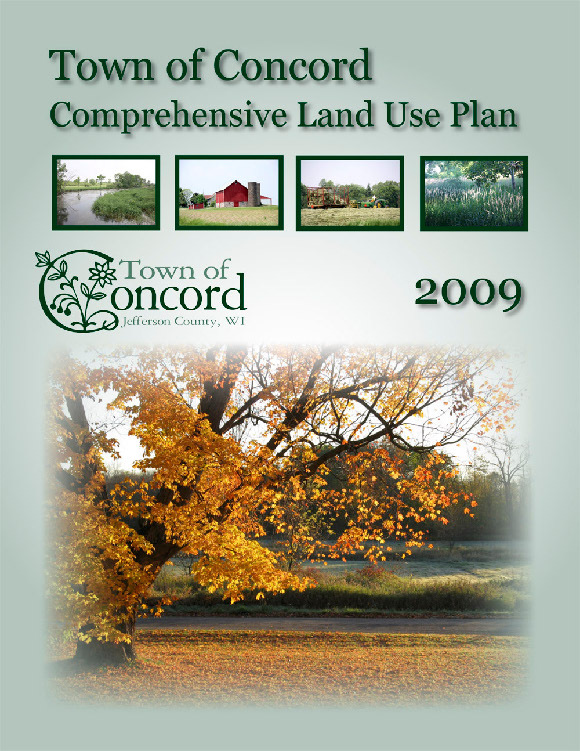 The Town of Concord Comprehensive Land Use Plan was adopted by unanimous vote of the Concord Town Board at a regular town board meeting on July 13, 2009, to take effect November 1, 2009. Click below for a copy of the entire plan. Developing the plan was a more than three-year community effort. In the early stage, three visioning sessions were led by Steve Grabow of the Jefferson County University Extension. The sessions were held in the Concord Community Center gym and were well attended. Bill Ingersoll was the head of the planning committee and the only appointed member. Vanessa Kuehner was hired through Ruekert Mielke to guide us through the early stages of the plan. She did an excellent job. The actual plan development was done by Concord citizens. Everyone who wanted to come to the meetings and work on the plan was welcome. The committee started by meeting on the first and second Tuesdays of each month. The first Tuesday meeting was to discuss plan issues. Anyone in Concord could present an idea or point of view about the particular element we were presently working on at the first Tuesday meeting. If they felt they needed an extended period of time for their presentation or to bring in a speaker they were requested to reserve time on the agenda, which was set at the second Tuesday meeting. The second Tuesday meetings were not to discuss the plan but to set the agenda and any other details that might be needed to make the first Tuesday meeting work smoothly. As time went by we no longer needed the second Tuesday meetings. After each meeting, minutes and changes to draft copies of the plan were posted on the town website for everyone to follow. It was agreed early in the planning process to settle any lasting disagreements at planning committee meetings by sending a letter/questionnaire to everyone in town. A letter with three questions was sent to all Concord residences after the committee had covered all the elements of the plan, and the final plan reflects the results from residents' responses. Steve Grabow of the Jefferson County University Extension office was a tremendous help throughout the planning process. Sally Williams put in many hours writing up many drafts before we reached the final copy. Concord has a town plan that was produced by many residents who put in many hours to create it. Archive of minutes and materials used in the process of producing the Concord Town Plan.